Are there any rules governing whether or not a verbal phrase can be split by its subject? ¿Hay algunas reglas que rijan sea o no una frase verbal se puede dividir por su sujeto? ANSWER KEY: Vienen muchos inmigrantes a trabajar en los campos freseros. *This is exactly the same translation as used for the original sentence, but anything else just sounds really unnatural to me in English. MY ANSWER: Vienen a trabajar muchos inmigrantes en los campos freseros. *Again, this is exactly the same translation as used for the original sentence, and the one for the answer provided, but anything else just sounds really unnatural to me in English. After discovering that my answer differed from the one found in the book, I began to wonder, Well, is my version incorrect then? If you have a broader understanding than what my example covers, please don't limit yourself to that question. appears to be in usage to some degree, is it something that could at least be considered grammatically correct? What about the sound of it? Does it sound natural? What about any of the examples in the verbs of motion chart? Especially with regard to those that yielded few or no results, would any be considered grammatically correct? Do any sound natural to you? HOJA DE RESPUESTAS: Vienen muchos inmigrantes a trabajar en los campos freseros. *Ésta es exactamente la misma traducción utilizada para la oración original, pero cualquier otra cosa simplemente me suena muy poco natural. MI RESPUESTA: Vienen a trabajar muchos inmigrantes en los campos freseros. *Otra vez, ésta es exactamente la misma traducción utilizada para la oración original, y la de la respuesta proporcionada, pero cualquier otra cosa me suena muy poco natural a mí en inglés. Después de descubrir que mi respuesta difiere de la que está en el libro, comencé a preguntarme, Pues, es mi versión incorrecta entonces? Si tienes una comprensión más amplia que lo que mi ejemplo cubre, por favor, no te limites a esa pregunta. parece ser en uso en cierta medida, ¿es algo que podría al menos considerarse gramaticalmente correcto? Y, ¿cómo le suenan a ustedes? ¿Suena natural? ¿Qué hay de los otros ejemplos en el gráfico con los verbos de movimiento? 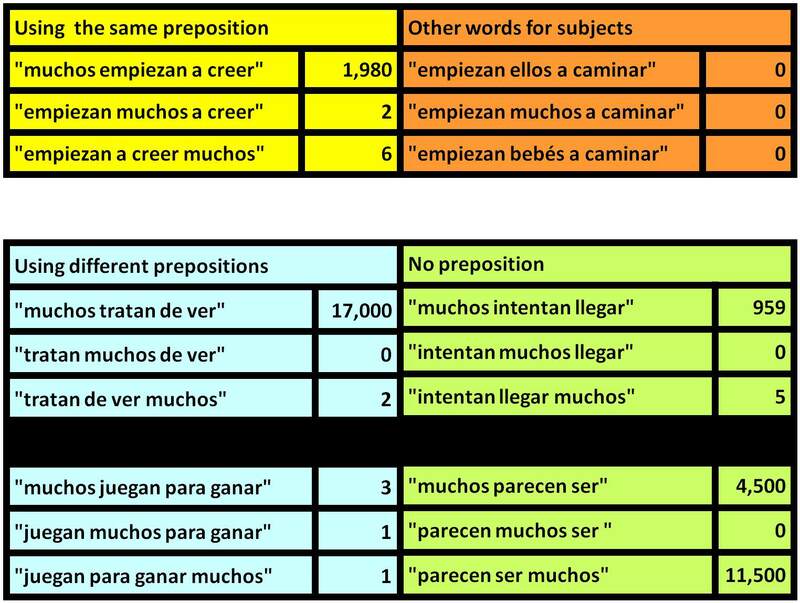 Especialmente con respecto a aquellos que dieron pocos o sin resultados, ¿podrían ser considerados gramaticalmente correctos? ¿Algunos les suenan natural a ustedes? 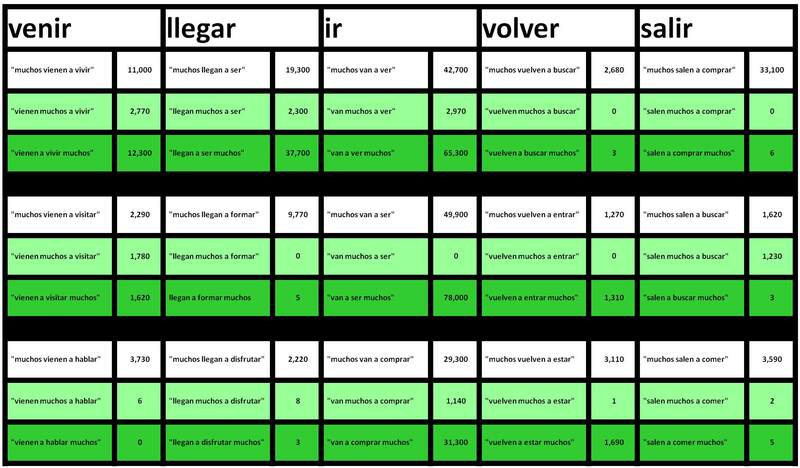 First, some pointers taken from an article about verb-first sentences in Spanish. The verbs of existence haber and existir go before their subject more often than not. Verbs often come before the subject in questions. The kind of example you gave (Vienen muchos...) is a bit tricky, but I think what's happening there is that the situation is similar to that of a predicate of existence. 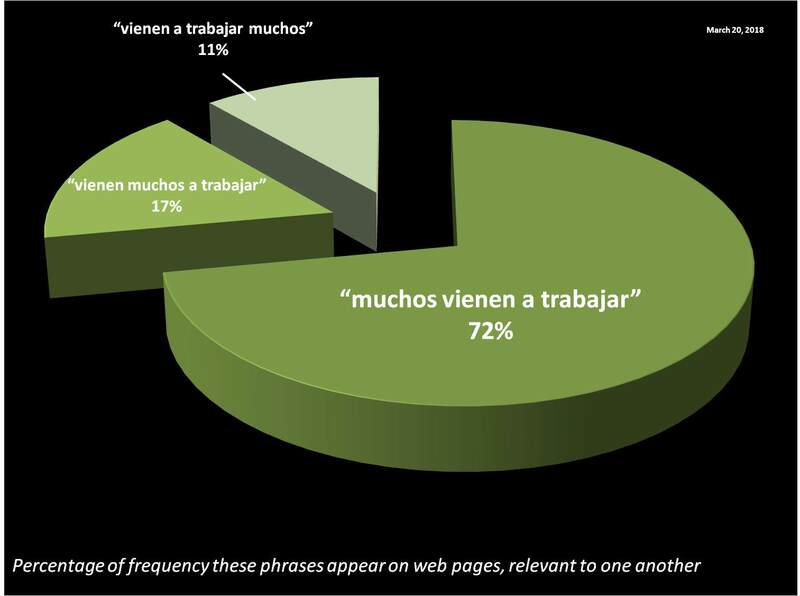 If you said Muchos vienen..., then those muchos would be the topic of the sentence, i.e. what you want to talk about. "There are many immigrants coming to work…"
"It so happens that many immigrants are coming to work…"
Los inmigrantes comenzaron a llegar ayer. Comenzaron a llegar ayer los inmigrantes. No. 1 is a statement about the immigrants; no. 2 is a statement about the fact that the immigrants have begun to arrive. YOUR ANSWER: Vienen a trabajar muchos inmigrantes en los campos freseros. I think you're asking whether there's a rule that tells us whether, or when, it's okay to interrupt trabajar en los campos freseros by putting something smack dab in the middle of that phrase, between the verb and the prepositional phrase related to that verb. I would say that it is permissible to do so, but it chops up the meaning uncomfortably. It doesn't sound natural or comfortable to my ear. 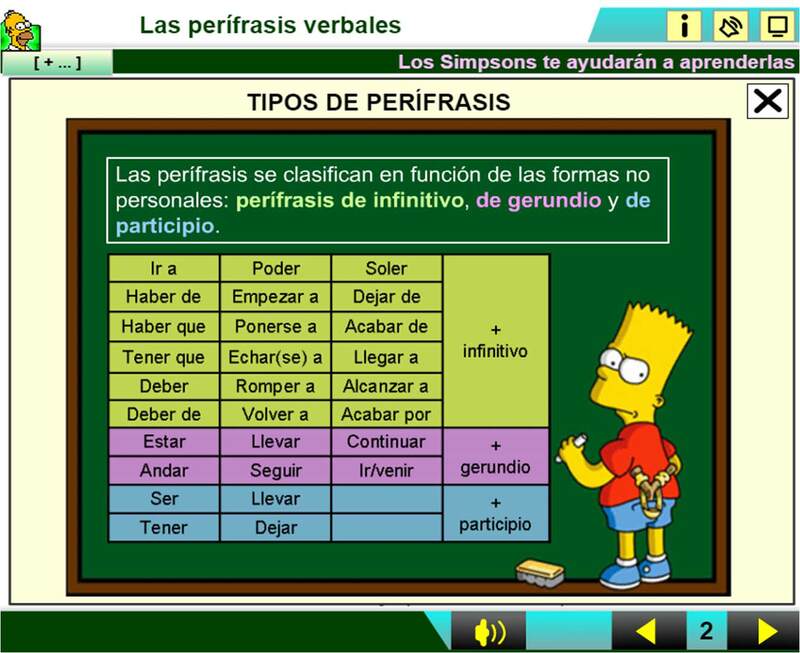 Never thought I'd have much reason to return to this complicated question, but I've recently begun reading about Spanish grammar using materials written in Spanish and am beginning to discover details to the Spanish language that I never knew existed. In an attempt to close a knowledge gap that I identified earlier today, I stumbled upon this grammatical concept known as the verbal periphrasis and after reading through a few pages I found on it — some in English and some in Spanish — I was reminded of this post I made here. To provide a quick recap, my post above started off with the question, "Are there any rules governing whether or not a verbal phrase can be split by its subject?" It was a question I had after reading an answer in a grammar book I happened to be reading at the time. My post above indicates that I was curious about whether or not the type of preposition somehow influenced the splitting of a verbal phrase and then this led to wondering if, instead, it was the type of verb itself. Then, when pablodf76 mentioned "verbs of existence," I automatically assumed that was the missing link to understanding my question. While pablodf76's answer was very good and the one I gave the green check mark to, I realize that such an answer (the one found in the grammar book's answer key, not pablodf76's answer) may have led me down a bit of a rabbit hole that I wasn't sure was all that worthwhile pursuing after all was said and done (although what I posted above may help some rule out certain notions should they ever ponder about something similar). I also realize that what I had been trying to do is find a rule that would help me make sense of the answer I found in the aforementioned grammar book whereas the research I did earlier today was in pursuit of a more general rule that just happens to apply to this question I posted here. What I add here isn't so much an answer, but an opportunity to share a few links with Spanish StackExchange users that address this topic. Since some of the material I found came from sources written in Spanish, these links may be particularly useful to those who don't typically go beyond pages written in English when looking for an answer to their question about Spanish. Before I get to the material/links I found while trying to better understand "verbal periphrasis," I'm going to add a Reddit link that included a post from someone whose answer was quite thorough. The person who wrote it doesn't cite any sources, but claims to be bilingual. He/she is actually addressing adverb placement, but some of what expremierepage wrote definitely seems to apply to my question. You can access that post here. As for "verbal periphrasis" which I believe my example — vienen a trabajar — really is, I'm not going to regurgitate what I found elsewhere. Instead, I'm simply going to leave a screenshot from one site and then provide links to some of the pages I found useful. As you can see, there are three types of verbal periphrasis listed and while the chart puts "venir" with "ir" as the gerund type, my example in this post clearly doesn't use a gerund. Nevertheless, I feel that it is possible that "venir a trabajar" falls under the infinitive category in that its meaning may be a close approximation of constructs formed with "llegar a + infinitive." And don't think the list above is a complete list. I have yet to read that there is such a thing and at least one site I came upon flat out stated that it would be impossible to create one due to the fact that the combinations of words that could be considered verbal periphrasis would be too many to enumerate. I might now make the assumption that the author intended to convey a more literal meaning of "vienen" and that "muchos inmigrantes" come to work, literally, (e.g., by foot/bus/train). * I believe I made some sort of comment similar to this previously in this thread, but what I read here, especially the section titled, "Qué son y qué no son perífrasis," might further support anything I may have mentioned earlier. En las perífrasis verbales puede ocurrir que entre el verbo auxiliar y la forma no personal aparezca un adverbio o locución adverbial, sin que por eso se rompa la unidad de la perífrasis. Note: The first two sources listed after the Reddit post also have a quiz you can take at the end to test yourself on whether or not you've understood the material. Not the answer you're looking for? Browse other questions tagged orden-de-palabras verbos-auxiliares or ask your own question. How do you specify/emphasize gender with third person reflexive verbs?